The quadruple helix model adds the element of citizenry/community. This article is part of two ongoing series of articles: stakeholder and community engagement and KM in international development. As I discussed in my masterclass at the recent Knowledge Management Singapore (KMSG18) Conference, “open innovation” has become one of the most important innovation research and practice trends worldwide. 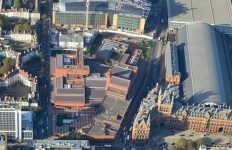 For example, Carlos Moedas, European Union (EU) Commissioner for Research, Science and Innovation, outlined the goals of his department as being “open innovation, open science and open to the world” in a 2015 speech. 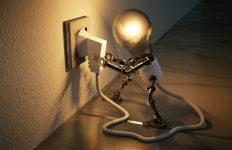 Research shows that knowledge management and innovation are very closely linked, with a range of knowledge management activities found to support innovation and open innovation. A recent evolution of open innovation has the potential to significantly enhance these links. This evolution is the quadruple helix model of open innovation, which has been proposed as the next phase of open innovation (open innovation 2.0). In the previous triple helix model of innovation, the three elements of academia, industry, and government interact to foster economic and social development. The quadruple helix model adds the element of citizenry/community. 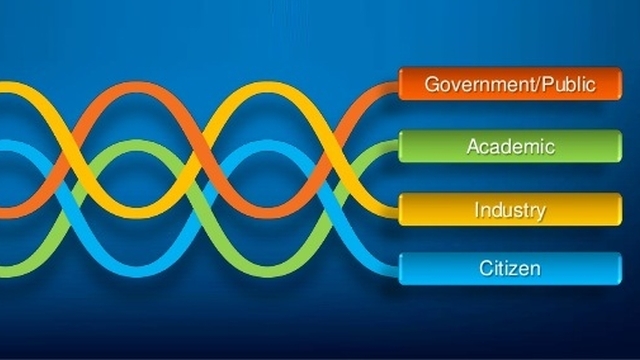 Evidence-based knowledge management, where there is considerable alignment between the four helices of the quadruple helix model (academia, industry, government, community) and the four sources of evidence (scientific literature, practitioners, organisation, stakeholders). Knowledge management for development, where there is an apparent move towards knowledge co-creation involving multiple stakeholders and a crossing of the boundaries between scientists and society1. A 2016 paper2 picks up on both of these potential applications by looking at how the quadruple helix model can support the knowledge-based development of remote, rural, and less-favoured regions. Regional development seeks to make changes that will turn the current direction of a region into a desirable future, and in the EU, the strong emphasis on innovation means that it is now core to most regional development programs. The authors advise, however, that the innovation strategies may not be the best fit because they are typically developed by policymakers located in urban areas, and based on policy models that are often assumed to be universally applicable. Regional development requires actors and actions, so policy or governance “regional development networks” emerge to support the development of a region in question. These regional development networks typically comprise the triple helix model elements of academia, industry, and government. The networks have become more and more influential as “wicked” problems and challenges have emerged that cannot be solved by just one authority or through straightforward measures. But “wicked problems” need to be tackled by many actors at the same time or sequentially, and regional communities have a fundamental role in the regional dynamics that are a consequence of this. Further, in remote, rural, and less-favoured regions, one or more of academia, industry, and government may have only a limited presence or be not present at all, which makes the involvement of regional communities even more important. Because of this, the authors propose a “double-coin model of knowledge-based regional development” that incorporates the quadruple helix model of open innovation (Figure 1). Figure 1 (click to enlarge). Double-Coin Model of Knowledge-Based Regional Development (source: Kolehmainen et al. 2016). Knowledge-based development of remote, rural and less-favoured regions is very challenging, as the preconditions are not naturally inclined into that line of development. Achieving genuine and sustainable competitiveness calls for visionary, insightful and targeted strategic thinking … Thus, turning disadvantageous characteristics of a region into competitive assets requires good strategic thinking and actions, but also usually genuinely mutual interests, commitment to the collaboration and excellent quality in the collaborative processes of all the quadruple helix actors. The South Ostrobothnia (Finland) case revealed that reaching a solid, shared vision for the region in question is a long-lasting process in which encouraging milestones are important … [T]here need to be regional forums and arenas in which shared visions can be discussed and shaped among different quadruple helix actor groups … In creating shared vision and planning, and especially carrying out concrete common measures, people that have a connecting role in local and regional networks have an important role. The Västerbotten (Sweden) case showed that developing multi-institutional learning environments is a solution for a remote and peripheral region to response to the educational needs and to open up new avenues for the development. The internationally increasing number of this kind of arrangements implies that they are an applicable tool for the knowledge-based development. The North Great Plain Region (Hungary) case illustrated the ways how a research-intensive university can vitalise and strengthen its regional ties. Triple-helix collaboration is very important in this respect, but the University of Debrecen has also discovered the value of the fourth helix. For example, the Innovation Shop is a serious attempt to involve customers’ views and expertise in innovation processes. The Highlands and Islands (Scotland) case showed that a very peripheral region can achieve excellence in a certain field. 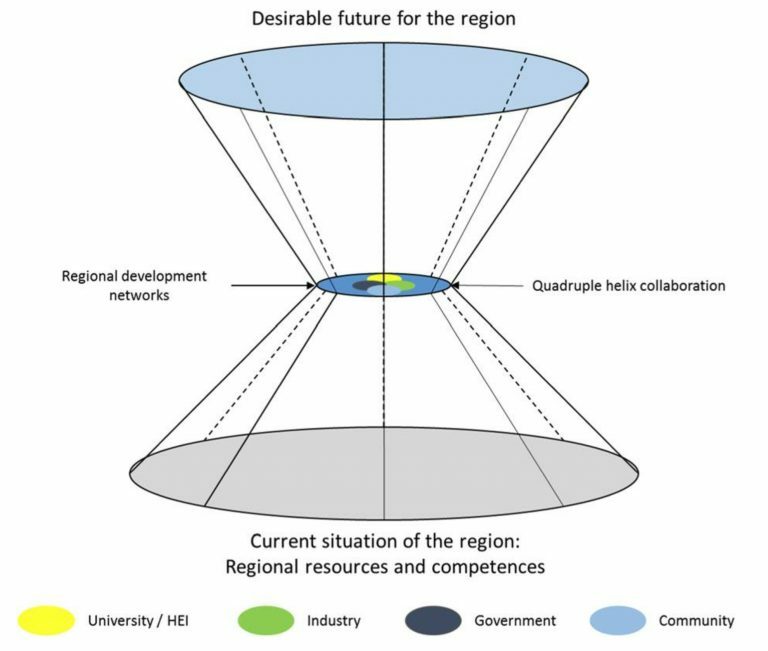 This calls for intense local and regional collaboration among triple-helix actors … [A]n important lesson learned … is the importance of gaining local community input into local issues, rather than assuming a top-down, onesize-fits-all approach. Searching for and adopting relevant ideas and knowledge wherever they can be found, and maintaining a strategic view of the community’s needs, can help policymakers design strategic programmes that better fit local, regional and national needs. Acknowledgement: With thanks to Lee Zhong Nan, who introduced me to the quadruple helix model of open innovation at the KMSG18 conference. Header image source: Charlie Sheridan & Vinny Cahill.